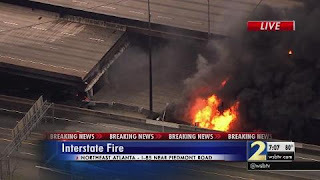 Interstate 85 in Atlanta collapsed on the evening of March 30, 2017. Three sections of both the Northbound and the Southbound road had to be replaced. It was completed by May 14th 2017. 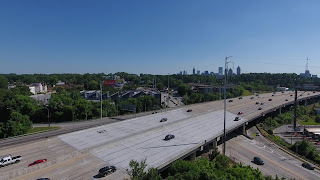 We took a drive to see for myself and flew the drone for some pictures. It is indeed open and I am amazed at the cleanliness and completeness of the work. Amazing. It took less than 2 months working around the clock. Well done. If we were in NY it would have taken at least a year.